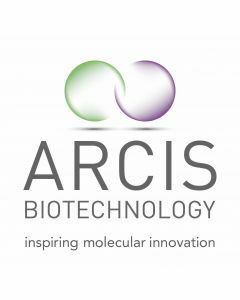 Arcis Bio | ARP American Research Products, Inc.
Arcis Biotechnology is a research and development led company with expertise in the development and commercialization of a wide range of fast and convenient sample preparation technologies. Based at Sci-tech Daresbury, where we have fully equipped laboratory facilities, the Group has already developed a number of patented compounds and technologies that have been enthusiastically received in the commercial marketplace via our licensing partners. 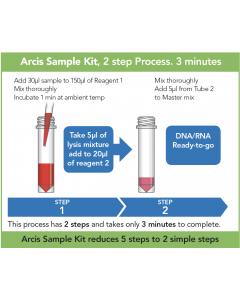 Arcis reagents are an ultra-fast sample preparation system for the preparation of DNA and RNA, with the added benefit of preserving and protecting nucleic acids for up to 90 days (DNA) without temperature control and without any additional processing. The kits have been demonstrated effectively on whole blood, blood plasma, cell cultures, sputum and many other sample types. The nucleic acids are suitable for direct use in PCR, qPCR and RT-qPCR reactions using standard and fast cycling protocols. The fast and convenient protocol uses a simple 2 step process that enables you to go from sample to amplifiable DNA or RNA in under 3 minutes. It is currently available as easy to use kits which contain a unique formulation developed and patented by Arcis Biotechnology. The kits are available as two bulk tubes (48 reactions) for pre-analytical processing of a variety of samples including whole blood, bacteria and viruses and is designed for standalone kit use or OEM integration with sample preparation or assay development manufacturers.